Mac OS X’s built-in Address Book utility and iCal calendaring application have earned a good deal of (deserved) praise, but they aren’t perfect. 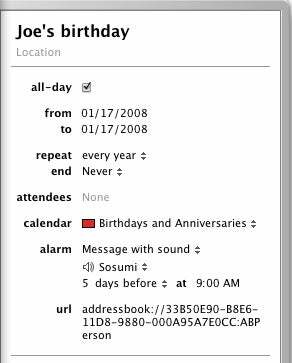 One of the most common complaints I see is that that if you’ve got birthdays entered in Address Book, you can’t easily set up reminders for those birthdays in iCal. 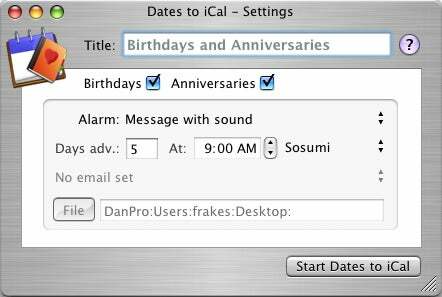 iCal’s built-in Birthdays calendar can automatically display Address-Book-added birthdays as daily events in iCal, but you can’t edit those events—which means you can’t set alarms for them. Your newly-created calendar will soon be filled with alarm-enabled—and editable —events corresponding to the birthdays and/or anniversaries in Address Book. Yes, you can even edit those events, something iCal’s built-in Birthdays calendar doesn’t allow. You can also edit the new calendar itself, meaning you can manually add birthdays and anniversaries for people who aren’t in Address Book (iCal doesn’t let you add events to its built-in Birthdays calendar). The first time you run Dates to iCal, it launches an invisible background process and adds a Dates-to-iCal-Launcher item to your Login Items list in System Preferences’ Accounts pane. The latter makes sure the former is always running so that future changes you make to birthdays in Address Book are synced to iCal. (Dates to iCal watches for changes to Address Book birthdays and anniversaries; when it detects a change, it stores those changes so that your iCal calendar is updated the next time iCal is launched.) However, syncing is one-way; if you make a change to a birthday event in iCal, Address Book won’t reflect that change, so you’ll want to make changes in Address Book and let Dates to iCal sync them to iCal. Dates to iCal is a handy tool that adds a much-requested (and should-already-be-there) feature to iCal. Dates to iCal works with Mac OS X 10.4.4 or later and is a Universal binary.